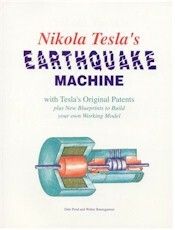 Much of the material presented in this book is related to the construction of a class of machine invented by Tesla and known as the reciprocating Mechanical Oscillator. Serious students of Tesla's work may recognize this machine as the basis of his system for producing electrical vibrations of a very constant period. In 1898 another variation was used to create a small earthquake in the neighborhood surrounding his Houston Street lab. Tesla called this method of transmitting mechanical energy "telegeodynamics." Included are mechanical drawings that will guide you through the construction of a working model of the Tele-Geo-Dynamic Oscillator, plus a comprehensive description of the machine in Tesla's own words. Short audio sample of a mechanical oscillator constructed and operated by Walter Baumgartner.